Churachandpur, Nov 15 : The Kuki State Demand Committee (KSDC) on Wednesday released its map of the proposed "Kuki state" with an area spread over five hill districts which is almost over half of Manipur's territory. The map covers Churachandpur district, Sadar Hills in Senapati and large chunks of land in Tamenglong, Chandel and Ukhrul districts. 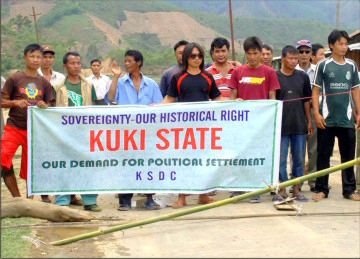 On the other hand, the KSDC had announced that it will call an indefinite roadblock on the national and state highways passing through Kuki-inhabited areas in Manipur from Thursday evening in pursuit of its demand to create a "Kuki state". However, it deferred the stir on Saturday. Incidentally, Imphal-Dimapur and Imphal-Silchar highways, the key supply routes of land-locked Manipur, pass through numerous Kuki-dominated areas. "In public interest owing to 'Ningol Chak-kouba', one of the biggest festivals of Manipur that falls on Thursday and on request from different civil bodies of the state, we have resolved to defer the date for two days. Now we will begin our stir from Saturday evening," said KSDC general secretary Benjamin Mate. Benjamin said the stir will continue till the time the Centre gives an official assurance that political dialogue between it and KSDC and Kuki militant groups which are currently under the Suspension of Operation (SoO) with the government will begin on a pre-arranged date to discuss the demand for a separate statehood for the Kukis. He also warned of launching 'Quit Kuki land' movement if the Centre fails to heed the Kukis' legitimate and democratic demand. "Our demand is legitimate and democratic and it could be implemented under the provisions of the Constitution of India," said Benjamin at a hurriedly summoned media conference at Churachandpur headquarters about 65 kms from Imphal. On being asked about Manipur deputy CM Gaikhangam's strong reaction that Manipur cannot be divided into pieces by any demand, Benjamin said "He (Gaikhangam) is bound to say such things as he is deputy CM, but our demand is legal and legitimate." Stating that Kuki-Chin-Mizo is linguistically the second largest community in the northeast after Assamese, Benjamin said the proposed map of 'Kuki state' (within Manipur) also covers 350 Kuki villages evicted during what he termed as ' NSCN (IM) -led Kuki genocide of the 1990s." He said the committee has no support from any international community in its line of demand.